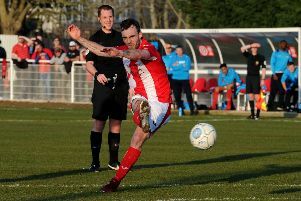 Kevin Wilkin was fulsome in his praise for Brackley Town’s players and supporters after the club’s memorable FA Cup run was ended by Blackpool in round two of the competition. A solitary first half goal from Jamille Matt settled Saturday’s second round tie in favour of the League Two outfit at Bloomfield Road. It was not the stirring cup tie of high drama and excitement of the two games against Gillingham in the previous round. Instead, a small and subdued home crowd left it to Saints’ 400 travelling supporters to make all the noise. Blackpool took an early lead through Matt and they hung onto till the end rarely threatening further goals and defending deep and in numbers to stifle the visitors. The 8-2 corner count to the visitors told the story but Matt’s finish sent the Tangerines through to the next round. Wilkin said: “The lads put on a good show and the fans came out in numbers to support us. We are disappointed not to have got a replay because we deserved something but the players acquitted themselves well. “We couldn’t give any more and gave a good account of ourselves. Good luck to Blackpool in the next round. “It was hard to break them down, we didn’t get around the back and work the keeper enough. Blackpool had done their homework and made life hard for us. “But the players stayed composed and we gave a strong account of ourselves. Going behind so early made things difficult but we pulled ourselves together. “We showed quality on the ball. Everybody had a fantastic game and I am proud of them.